OK, OK, SO THE GINETTA IS NOT A KIT car. But you try finding something, even in the diverse kit car industry, that compares with the Westfield for V8 power, compact dimensions and the facility for a rag top. Not as easy as it sounds, is it? Anyway, the G33 is almost identical in shape to Ginetta's earlier G27 and that was a kit car, so there. What is interesting is that these two superb cars, for all their visual differences, are actually remarkably similar under the skin. Both, except for the engine, are largely Ford based, both use all-round independent suspension with a Sierra rear differential transferring power to the rear Wheels, and both have all-round discs. In the power department both use the Rover 3.9-litre V8 engine with its standard 5- speed 'box, the Ginetta relying on the original injection system while the Westfield goes the whole hog with quad carburettors, major internal modification and performance exhausts. As far as the figures go, that little lot translates into the Westfield producing 270bhp at 6000rpm, 270ft Ibs torque at 4500rpm and a 0-60 sprint of 4.2 seconds. The Ginetta produces a respectable 205bhp at 5280rpm, 220 ft Ibs torque at 3500rpm and a sprint time of 5.3 seconds. Right, that little lot should satisfy the jargon jugglers amongst you, but what does It mean when you're on the road? Having picked up the Westfield from the Birmingham factory, I had some 130 miles in which to gain initial impressions of a beast that can, it is claimed, outpace a Ferrari F40 to 100mph. That's quite a daunting prospect, and to add just a touch more excitement it was raining. With the hood up the Westfield is not an easy Blip the throttle and the note instantly changes to a menacing growl before falling back once mote to the restrained burble. The clutch is thankfully user friendly and second gear can be selected for any normal start. It's only on hills that you might need first. Acceleration in relation to pedal depression is instantaneous; you simply cannot floor the throttle in second gear unless you want to induce immediate wheel spin. For even the most mundane driving the Westfield demands respect, although once you've learned the art of which gear to select and how to gently apply the throttle then the Westfield can, and is perfectly happy to, be driven easily around town. It is a wholly and utterly different driving style to that employed on normal 4-cylinder cars. Once you've scared yourself a couple of times and finally mastered the art of town driving, you may enter the world of super car performance. Exit a roundabout on the dual carriage way in second gear and you're in for some fun. Acceleration can only be described as astounding. The SEiGHT leaps forward and ploughs up the road like a mad stampeding buffalo. Select third and it's off again; no let-up, just bludgeoning, monstrous acceleration. Up to the 6000 rpm rev limit and fourth gear provides another punch in the ribs. It's only when fifth gear is selected that things appear to ease off, just a touch. With the buffeting wind pushing in the side screens, the steering getting a touch light and 180kmh on the clock, it's time to slow the beast. It's an unforgettable experience and one that makes nearly every other sports cars pale into minor insignificance. On the smaller roads, where such a large power unit can often become cumbersome, and light sevenesque cars can become jittery, the Westfield showed a maturity that surprised both Monty and myself. The independent rear suspension soaks up the bumps in a seemingly endless amount of available suspension travel. The front end is also well sorted and the steering gives a nicely balanced feed-back to the driver. Braking, from the non-servo Ford system, is excellent in most situations, being progressive, well weighted and efficient. For all its massive performance potential, the Westfield is a user-friendly prospect for the summer. It's easy to get in and out of, is comfortable over extended journeys, can be driven through town without fuss and can supply an instantaneous pump of adrenal in at a moment's notice. Biggest pain during our test was the necessity to use the side screens which, unless redesigned, don't keep out the rain, are obtrusive, obscure vision and are too floppy to be really effective. The Ginetta, by comparison, has an extremely draught-free interior even when the small side screens have been removed. The G33's bulging body design is quite beautiful and when the two cars are together it's the Ginetta that steals the show every time. What's so clever is that the gorgeous rounded body design has been kept to a very compact and small package, probably only inches longer than the Westfield. This particular car was an early example owned by enthusiast, John Dalgliesh, and variable shut lines: along with generally poor finishing, marred our initially favourable impressions. With the hood in place the Ginetta is just as difficult to get into as the Westfield, perhaps even more so. The small door and tiny side screen don't leave much room for entry and there's nothing to grab hold of as you get in that doesn't flex alarmingly. Like the Westfield, it's also pretty claustrophobic with the hood up and visibility is not terribly good. But at least the dem1sters work and there's no major water ingression. The Ginetta's hood has come in for some heavy slagging from some of the mainstream production car mag's and we soon found out why. It may look good once in place but it must be one of the most awkward set-ups we've come across to take off or put on again. With the hood off it can be stowed in the boot, which is pretty small but would just manage a couple of squashy bags, The hood frame pivots backwards and under the natty head fairing to leave an absolutely fabulous beast that is slightly alarmingly, devoid of any roll-over bar. Getting in without the hood in place is certainly easier but still an acquired art, and the fact that everything flexes so much on the car makes it difficult to hold onto anything for support. John had completely re-trimmed this car himself because he didn't like the original black trim. He's done a reasonably competent job that is only let down in certain detail finishing areas. Sliding down into the driver's seat envelops the driver in a very different environment to the simplistic Westfield. Some really good design work has gone into the interior but it's let down by the same poor execution that mars the exterior. In particular, the moulding of the panel that holds the heater controls and hi- fi is beyond excuse on any car that is aimed at the production market. The steering wheel partially obscures the rev counter and speedo to the degree that the rev counter is mounted almost upside down so that the driver can, at least, see some of the revs. Foot well width is fine and pedals are well positioned with the added luxury of a clutch rest. With the seat at its longest setting I found the driving position cramped with my knees up on either side of the steering column. Apparently Ginetta now offer an extended pedal box and I wouldn't be surprised if the company adopts this as the standard fitment. The gear stick is fractionally longer than the stubby Westfield item but is still well positioned for rapid gear changes. Twisting the ignition on this car ignites a far more familiar whining noise from the starter motor before the standard 3.9 injected V8 kicks into life. exiting through a single exhaust makes this car sound, utterly different to the Westfield. It's still an inspiring noise that is slightly more baritone in comparison to the Westfield's base burble. Throttle response appears quite slow with a more gradual build-up of revs. That makes the Ginetta rather more user-friendly beast than the Westfield. It's a far less daunting task taking this machine through town. Initial driving showed the suspension to be rather too harsh and we gather that Ginetta has since changed the coil-over shocks from this early car. The harder ride also highlighted the noticeable scuttle shake and general body movement that both Monty and myself both felt was unacceptable in a £20,000 car. On the positive side, the Ginetta displayed excellent road holding characteristics and very agile handling through twisting bends. Steering response was extremely sharp, reminding both of us about various mid- engined sports cars we've driven. That really is quite an achievement considering the engine configuration. Steering feel, however, was rather disappointing with minimal feedback to the driver. Not good in what is essentially a 'driver's car'. Flooring the throttle in the Ginetta produces a very different scenario to the Westfield. There's not nearly as much of the neck snapping, kick-in-the chest acceleration; more a refined surge of power. The exhaust note is once again quite different and on changing gear the revs drop off very slowly in comparison to the Westfield's almost immediate return to idling speeds. At first, l felt the Ginetta was considerably slower than the claimed 5.2 seconds 0-60 dash would suggest but, as time went by, further bursts of power revealed that the little car did, in fact, accelerate extremely fast and was probably right up with its claimed performance. Smooth power delivery combined with a beautifully slick gearbox clearly disguised the car's true potential. The Ginetta, when John bought it, would have cost around £18,000 and it clearly suffers from some unforgivable teething problems that established production car manufacturers simply would not allow. Still, this was only the third completed example to be presented to the public and John has tried more up-to-date cars and assures us that they are much improved. At the current list price of just over £20,000, I should hope so to. The Westfield can also be bought in near turn-key form, and when supplied to the specification we tried it weighs in at a hefty £20,0001 Now that may surprise many of you, but don't forget that it includes almost £7000 worth of very special engine. Also bear in mind that Caterham's flagship model, the HPC, will currently set you back just over £19,000. You can, of course, build the SEiGHT yourself and, with the same £7000 engine, you'll be looking nearer the £16,000 mark. Ok, so that's the figures, but which would I choose? Hmm, surprisingly, the answer isn't as easy as I though it might be. The Ginetta, for all its stunning looks, is simply not good enough in the state in which we tested it. With all the problems of footwe11 length, scuttle shake, body rattles, suspension settings and some dubious panel fit sorted out, the Ginetta would represent reasonable value for money - by all accounts, that has now happened. The Westfield SEiGHT, in contrast, suffered very few problems.. doing everything expected of, it and a little bit more. It has an awe inspiring engine, comfortable but minimalist cockpit and well developed suspension for such a car. So, at the moment, the Westfield V8 wins the day, just. A new G33 might tell a different story but, as tested, the Westfield simply provides more fun per pound than the Ginetta. What I find interesting is that the Ginetta is not that much more practical than the Westfield. Its tiny boot is definitely an improvement, as is the hood which does at least keep out the rain, but the car Is more awkward to get in and out of and the hood is a nightmare to operate. That draught-free cockpit is the only area of practicality where the car wins hands down over the Westfield, but it simply isn't enough to change my mind. IT HASN'T BEEN AROUND LONG BUT the SEiGHT has already become a legend in its own lunchtime. Whatever kit the industry produces, no matter how small, there's always someone who squeezes a V8 into an existing model, With the SEiGHT, Westfield have done a factory job for their wide-bodied SEi, just to show how it's meant to be done. A sort of cross between a Cobra and an SEi, the V8 version visually demonstrates its prowess via a set of very obvious air filters and Dell'Ortos protruding from the bonnet and a generous pair of side pipes. The casual onlooker may well realise that this is no ordinary cat of the Seven ilk. Without the hood in place, the Westfield is a simple step-in-and-slide-into position job: That roll-over bar is a good hand hold for exit and entry and I had no difficulty in sliding into the cockpit. Plenty of foot well clearance and dash/steering wheel clearance at the knees. Excellent positioning of the pedals and gear lever make it an instantly drive able car. " Lap/diagonal seat belts are also much more user-friendly than harnesses. Controls that would normally be on a column stalk in many cars have been transferred to dash switches, and the indicators are on a toggle switch within easy finger reach from the wheel. 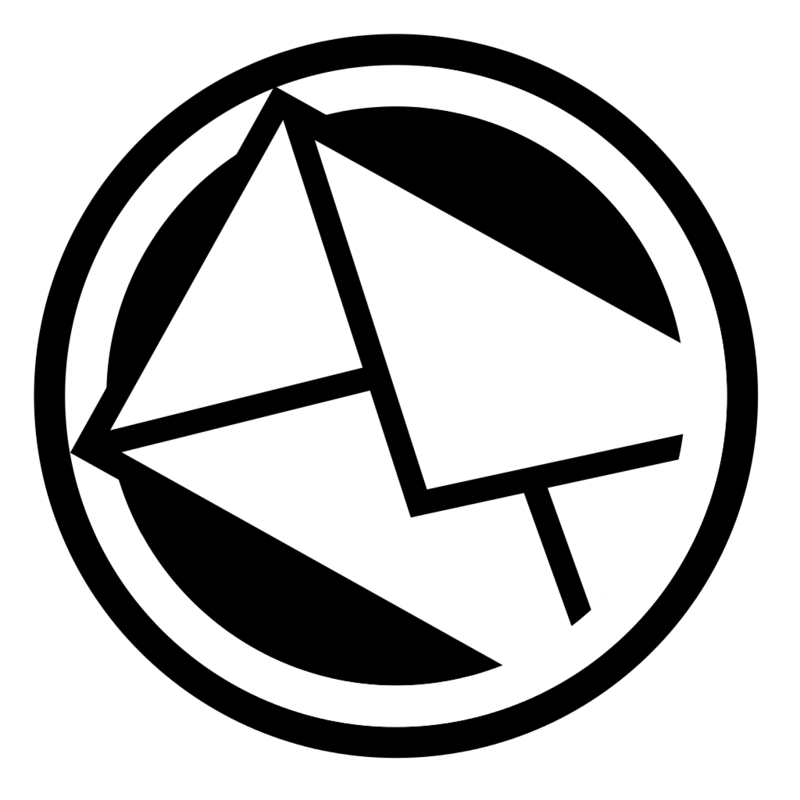 Line-of-sight main clocks are easily visible but only with the wheel in the dead-ahead position. Although the engine seems monstrously big in the bay, it doesn't make the diminutive SEiGHT a monster to drive. Light clutch feel, good braking and firm throttle springing are all easily learned, even for size ten feet. That's an essential recipe for quick driving without distraction from controls. There's a small rear parcel shelf which is handy for small odds and ends. Larger luggage would have to be strapped down to avoid losing it with the hood off. If you've got a long journey ahead, in the rain, with a few items of luggage, best advice is to take the train. Small cars such as this seem to suffer hideously from wind noise and hood boom, let alone the odd leak and reduced visibility. Entry and exit are both pretty difficult with the hood in place and, as Ian found out, it's rather tiring after a hundred miles. 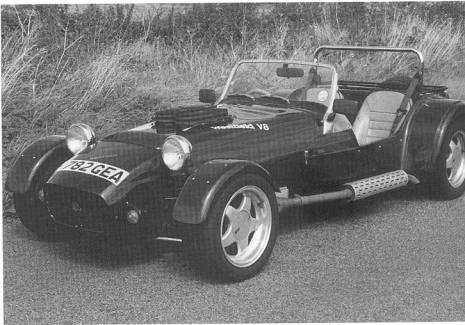 In guaranteed dry weather, it's possibly the ultimate runabout, although the hinged side screens are a permanent must as the near-disastrous aerodynamics of the Westfield create a pretty strong buffeting in the cockpit without them. Occupants have to wear eye protection of some kind as, otherwise, turbulence at speed causes eyes to water copiously, hence reducing visibility. 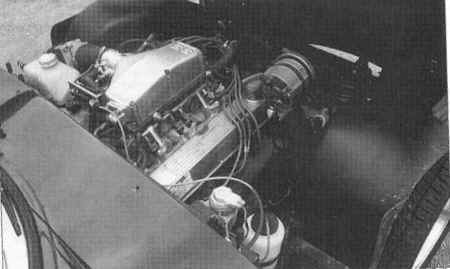 A standard five-speed box fitted to the tuned Rover V8 is easily managed, even though this particular example must have been given a pretty hard time in the demo car. There was slight crunch into fifth but otherwise it was good. coping with drama-free traffic driving as well as serious road burning. Initial impressions of the Westfield brought to light its surprisingly sedate nature. It's not a highly-strung thoroughbred that burns rubber on tick over. It can be very nicely manoeuvred, has a good steering lock and an acceptably quiet burble at low revs. Due to the good torque delivery of the Rover 3.9, tuned for even more of the same by JE Motors of Coventry, 1he clutch can be easily tickled for pottering in and out of confined spaces on tick over. Once you get to somewhere a little more open, moving the tacho needle a little further around the scale, it's like a different engine. Kick-in-the-pants torque through the gears without having to reach the red line every time. The motor hardly seems to notice that it's pulling a car as wel1 as itself. Huge acceleration right though to 5000rpm in each gear. 3000rpm in fifth equated to about 120km/h on the metric speedo, so 80 mph really isn't a problem for the Rover in the Westfield. Ford's Sierra differential coped well with the grunt, traction seeming pretty good in the dry even without a limited slip differential. Just a touch of wetness about the tarmac, though. and it was easy to induce the rear to dance a bit in most gears. Not dangerously so; you could still put down a fair few horses with confidence, but take it easy exiting corners! Excellent steering feel gives the driver a good idea of what the road is doing beneath the front wheels. Quite low-geared steering is manageable at low speed and pretty sharp out in the fast lane. Perhaps a little too much initial under steer, with the front tyres giving plenty of warning scrub before they go. Abuse it and you can have the back end out. Getting the rear back into line is a bit of a skill at speed; you've got to be quick or you're spinning. Nevertheless, dry weather grip and traction are good. There's some detectable chassis flex but nothing to write home about. Particularly worthy of note was the standard of the suspension set-up, with long travel front and rear and a surprisingly smooth ride. Perhaps the slightly heavier engine makes it easier to smooth out the bumps? No pain in the back and very few shakes and rattles from even a rough country - road. Tyres fitted at the time of test were 205/50 x 15 front and pretty massive 225/50 x 15 rears. These were Goodyear Eagles, V-rated. Perhaps a slightly softer compound would benefit overall grip? We'd like to try the same car on AO08 Yokohamas or even AVS's. Braking was up to the job, with plenty of feel. It wasn't that light pressure/massive braking force effect that many modern cars give, but a more forgiving feel. A firm foot could lock up the wheels at will put not before hauling the speed down very adequately. However, we did notice that the SEiGHT would on occasions be rather vague under heavy braking, with the nose weaving around a bit. Pretty daunting sometimes. 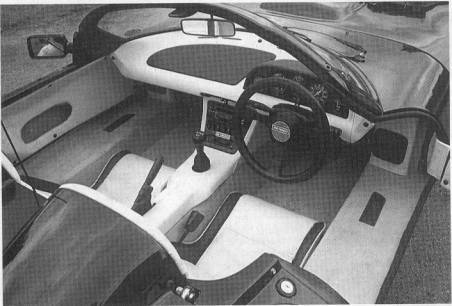 Above: Interior of the Ginetta looked great from a distance but John's retrimming exercise was let down by slightly poor detailing. Colour choice was far more exciting than the old black trim. Below: Westfield SEiGHT hardly tries to disguise its intentions.